Our patented 5-Slot folding glass rack. Comes just the way you see it. With hardware installation kit. Made out of aluminum. Will never rust. All TIG welded. Will give you a lifetime of service. Mast height of over 18" which allows you to safely carry the larger windshields used in today's automobiles. Custom racks are also available upon request. Made in USA. 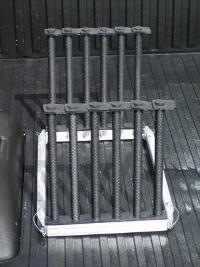 Our aluminum racks are half the weight of conventional steel racks so shipping is less. Comes with a 5yr warranty against breakage. Will be repaired or replaced at no cost. Does not include damage caused by misuse, abuse or acts of nature. How often do you need to carry something in your truck or van, but can’t because your glass rack is in the way? Well we've solved your dilemma. Folding windshield racks. Just drop them down and pile your stuff on. Heavy duty aluminum and TIG welded provide strength and durability that will give you a lifetime of service and yet still be able to haul things when you're not at work. The 5-slot rack is for the shop that does both glazing and auto glass yet works from one truck. Our patented 9-Slot folding glass rack. Comes just the way you see it. With hardware installation kit. Made out of aluminum. Will never rust. All TIG welded. Will give you a lifetime of service. Mast height of over 18" which allows you to safely carry the larger windshields used in todays automobiles. Custom racks are also available upon request. Made in USA. Our aluminum racks are half the weight of conventional steel racks so shipping is less. Comes with a 5yr warranty against breakage. Will be repaired or replaced at no cost. Does not include damage caused by misuse, abuse or acts of nature. Four friction pins attached to lanyards on the frame of the rack provide a quick and easy way to raise or lower the masts and you never have to worry about losing the pins. Up and down in 30 seconds or less. These racks are ideal for anyone that has to haul around glass. Works wherever you need glass storage that way you can use it in your shop or on your truck. Heavy duty aluminum with no paint to chip and no steel to rust where can you go wrong? Here we are TIG (Tungsten Inert Gas) welding the rack!